The SW Idaho Chapter of the National Association of Residential Property Managers (NARPM) just released their 2014 4Q survey results. As the below graphs show, vacancy increased slightly in the 4th quarter. During the summer months when we see the most moving activity, vacancy rates can easily overstate vacancy because of the lead time it takes to get a vacant property move-in ready. I think Q4 numbers give us a better picture of any surplus or shortage of inventory, and I don't see any indication that we have a surplus. Boise and Meridian continue to build more and more multi-family properties, but so far there is no indication that we have over built. Also, rents have continued to improve. I think we'll continue to see rents improve until we see some surplus in inventory because the demand to rent continues to be strong. The first graph below is the vacancy rate chart from FRPM, with the vacancy rate for January 15, 2015 at 0.68%. "FRPM vacancy rates continue to remain low due to our advertising strategy and property turnover plan," says Leasing Team Leader, Melissa Sharone. A lot of property management companies wait to advertise properties until they are vacant or sometimes they wait until after all repairs and cleaning have been completed. FRPM begins advertising the moment the current tenants give notice. 8 times out of 10, FRPM has a new tenant selected before the old tenant even moves out. When Melissa talks about our turnover plan, she is referring in part to our renewal program and lease expiration dates. FRPM is very pro-active on contacting tenants on renewing. Also, throughout the year, we analyze lease termination dates and we purposely avoid bad times of the year to have leases terminate. Melissa believes that 2015 will be another great year with low vacancy and increasing rents. We'll be looking to identify any trends and will alert you should the data indicate otherwise. The purpose of this survey is to show vacancy and rental rate trends among single-family homes and multi-family units (2-15) in Ada and Canyon County. Survey results are displayed by type (single or multi-family) and bedrooms (1-5) for the respective county. Property status was surveyed as of December 29, 2014. Data from a total of 17 property management companies were included in the survey results, which accounted for a total of 5717 homes: 2396 single-family and 3321 multi-family. The accuracy and reliability of this survey is improved with an increased sampling. Vacancy rates moved slightly up to 3.2% for the 4th quarter. This is an increase of .6% from last quarter. The largest increases in vacancy rates from last quarter, was multi-family homes in Ada County with a 1.1% increase and single-family homes in Canyon County with a 2.6% increase. Rental rates in Ada County increased slightly from last quarter. The increase in rental rates in Ada County has been in all areas of the rental market, from single-family to multi-family. The increase in rental rates averaged out to be $33 over last quarter. 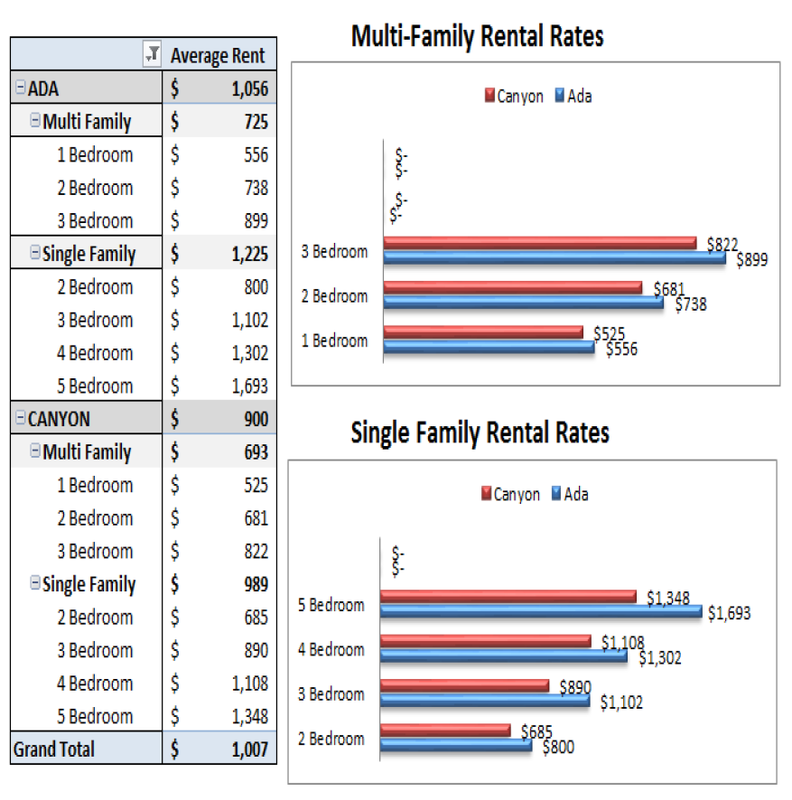 Rental rates in Canyon County also showed a slight increase. The rental rate increase in Canyon County was in both the single-family and multi-family homes. The increase in Canyon County rental rates was very minimal and averaged out to be $7 over last quarter. Although, the rental rate increases in both counties were minimal, they are very significant. To be able to show an increase in rental rates, in both Ada and Canyon County, during the most challenging time of year to rent a home, is exceptionally remarkable. In addition, we have been able to maintain the vacancy rates and historically high rental rates, for yet another quarter. 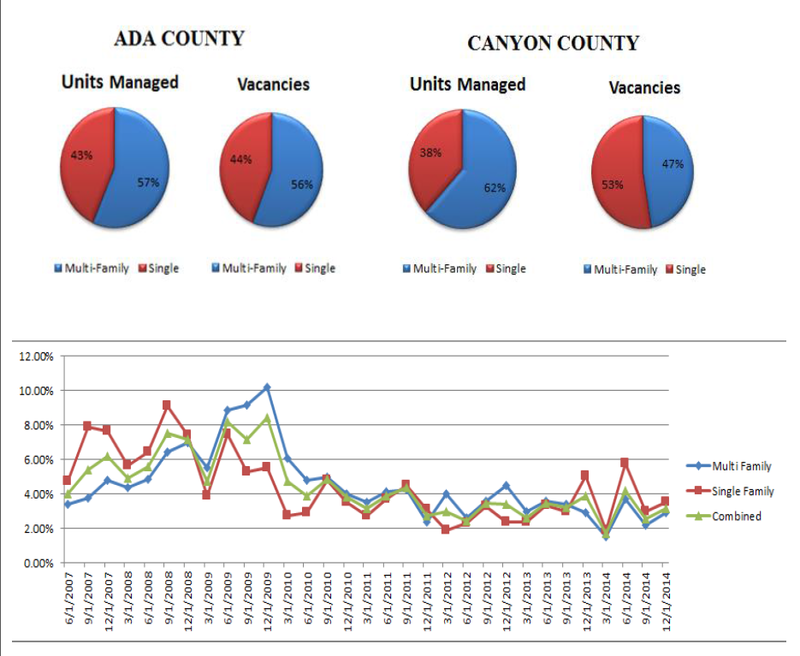 This shows we are still maintaining an incredible balance between our supply and demand of rental properties, in both the Ada and Canyon County markets. The SW Idaho Chapter of NARPM is proud to announce, the City of Boise has acquired our vacancy report data to help with evaluating their own housing needs. We are pleased to have been able to contribute to their planning needs. With this acquisition, it truly confirms the value in our quarterly vacancy survey.